I didn't even have a toaster until a few months ago because we didn't have room for it in any of the tiny New York City kitchens we've lived in. I toasted bread in a pan. We still don't have the space, but my husband got me a toaster anyway because life is too short to live without toast. So, when someone gave us a Béaba Baby Food Maker when Greyson was born, I wasn't sure where we were going to put it. There were so many other kitchen things that I wanted before a baby food maker: a crock pot, a panini press, a waffle maker, etc. Although I thought the Béaba was a great idea, I couldn't justify getting a machine that does things that we have other machines for. We can steam food on the stove and we already have a food processor. The friend of Rob's who gave us the Béaba included a gift receipt from Williams-Sonoma, but we let that window of time to return pass. What we did with the counter space taker-upper after the jump! Greyson started solids almost two weeks ago and I've been loving the Béaba. It makes baby food in the perfect quantities, so I don't have to wash big pots and a big food processor every time I make food for Greyson. I started thinking, though, that I could do more with the Béaba. Just because it's little and called a baby food maker, doesn't mean it's not a powerful cooker and food processor. The first time I used the Béaba for adult food was when I needed bread crumbs. I was going to tear the bread by hand because I didn't want to get the Cuisinart out of the pantry. Then, a light bulb went off. Béaba! It worked like a charm. 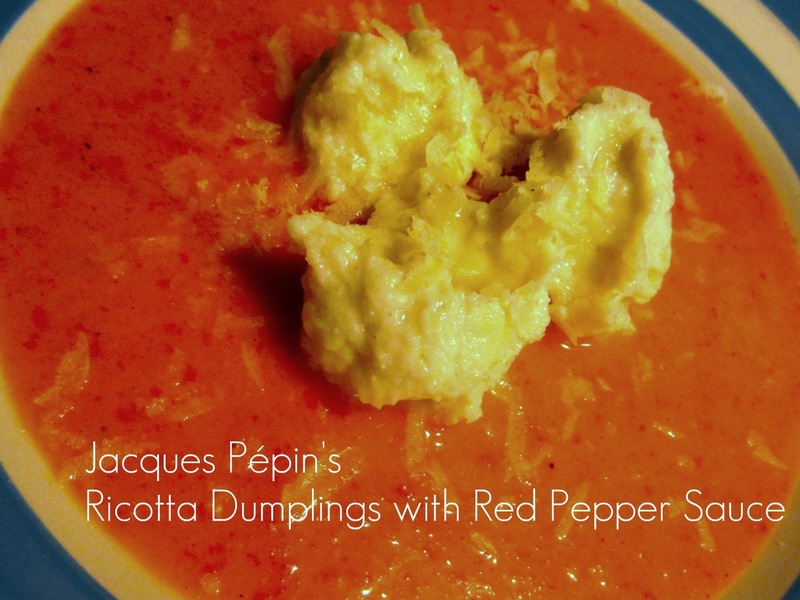 Then, I saw a recipe for Jacques Pepin's Ricotta Dumpling with Red Pepper Sauce when I was at the gym last weekend. I looked up the recipe today and it occurred to me that I could make most of it in the Béaba without any modifications to the quantities of ingredients. Step 1: Steam and purée the tomatoes and red bell pepper. Pour the to a sauce pan with salt, pepper and cornstarch. I didn't bother with a food mill since I don't have one. I just added the butter and then used my hand blender. You could also just add all that stuff to the Béaba and skip the pot part entirely, I think. Step 2: Add all the dumpling ingredients to the Béaba and purée your heart out. Step 4: Plate, garnish with grated parmesan and enjoy! I like the simplicity of this recipe...a few ingredients and a few steps. It's delicious in a minimalist way. A keeper! Here is the recipe from when it was re-published in Food and Wine.